On starting to fix our three-year-old's crossbite. Lee has an emergent crossbite. I noticed that there's something wrong with her teeth more than a year ago, but our dentist back in the UK (who was Finnish) said that in the UK it's not common practice to correct dental misalignment in toddlers (unlike in Finland), and she didn't have anything close to the tools to fix it. The dentist did say Lee might outgrow it, but she didn't - and worse, I could see the growth of her front teeth was increasingly impacted. But because I didn't know it was possible to do anything about it I didn't pursue the matter. When the dentist here came to preschool last month to check out the kids' teeth, Lee's report was comparatively grim: two small holes in her backmost molars (she used to bite down on the toothbrush when I brushed in the back) and a frontal crossbite. BUT - they said they could fix it. After repairing Lee's little molars (no tears! ), our amazing dentist got her started on the "Infant Trainer." The correct growth and development of your child is just as important as their health and education. Children develop most rapidly between the ages of 2 and 5 years. During this period, 70% of the growth of your child’s face and jaw occurs. Unfortunately, the majority of children do not experience correct facial and jaw development, resulting in unattractive faces and crowded teeth. So, now Lee has to wear the retainer at least 4 times a day at 15-min intervals and all through the night. She was enthused at first - sister 1 has clear braces which she now only wears at night, so they both have "bed teeth" - but it's already starting to become a chore. For the short term, she gets to play Teach Your Monster to Read and watch TMBG kids' music videos (she's moved on to "Nine bowls of soup" as her current favorite) during the 15-min sessions. For the longer term, I'm bribing her with a pair of jeggings from the Gap for three weeks of successful wear (though now she says she wants pink jeggings, which I haven't yet found as a button-free model). She also likes to pretend she's a baby and the braces are her pacifier; not my favorite type of game, but I play along. Our dentist said the earlier kids are started on it the faster it's likely to work - so I'm really hoping it'll become a normal part of her daily routine and that we'll see the benefits soon. And all in all, we're lucky - the issue is a) fixable and b) very minor in the greater scheme of things. The heading, by the way, is the second half of a Baudrillard quote which I actually think reeks of unfounded Euro-snobbery. 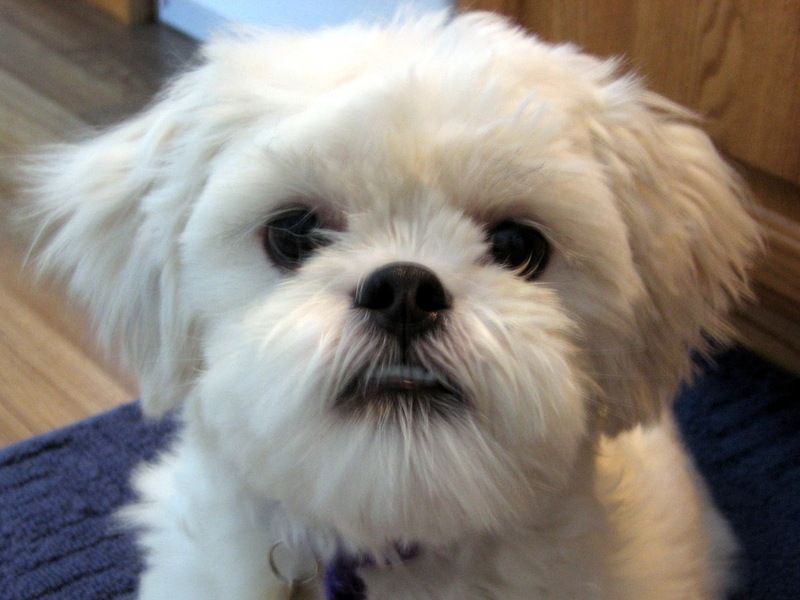 The photo is from Wikipedia - though it's a Lhasa A with an underbite, not a crossbite technically speaking.